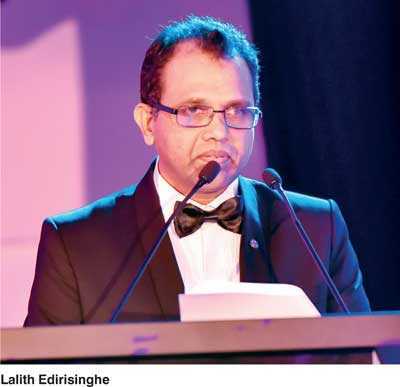 The Chartered Institute of Logistics and Transport Sri Lanka, popularly known as CILT Sri Lanka, recently staged Sri Lanka’s much-awaited, first ever National Logistics and Transport Awards Ceremony. The gathering had the opportunity to witness the most colourful and glamorous event ever to take place in the logistics and transport sector in Sri Lanka at the Kingsbury on 17 July. The participation was comprised of top-level government representatives, industry players, policymakers, professionals and academia. Prime Minister Ranil Wickremesinghe graced the occasion as Chief Guest. Transport and Aviation Minister Nimal Siripala de Silva and National Policies and Economic Affairs State Minister Dr. Harsha De Silva were the Guests of Honour. Dr. Lalith Edirisinghe, the Secretary of CILT Sri Lanka and Chairman of the National Logistics and Transport Awards Organising Committee, impressed upon the Prime Minister and subject ministers the need for establishing a statutory body to provide effective and efficient leadership in the logistics and supply chain industry in Sri Lanka. He also thanked the Ministry of Education for incorporating 20 periods of logistics lessons in the school curriculum as per the recent revision in the Advanced Level syllabus in the Commerce Stream. There were eight awards in the corporate category and one lifetime individual award presented at the ceremony. The awards committee initially called for nominations under three categories: Large, Medium and Small – considering the financial status of the applicant. Participation from the medium and small-scale categories was very poor and none qualified to be nominated under the two categories. “However, according to our consultant experts it is a natural phenomenon in the first competition of this nature,” he added. It was recommended by the eminent panel of judges that eight nominees who had reached minimum levels in the large category should be highlighted and commended not only for their contributions but for the confidence in contesting and reaching the satisfactory minimum standards set by CILT Sri Lanka. This will attract greater industry participation next year. Accordingly, the panel of judges decided to recognise eight corporate entities, instead of the two that were originally planned, in the first ever awards ceremony in Sri Lanka. It constituted platinum, gold, silver, two bronze and three merit awards. The key focus was to make the most impartial decisions when selecting award-winners. There has been no interference from CILT Sri Lanka with the panel of judges, and none of them has had any conflicting interests with applicants or nominees. There were also many sponsoring opportunities, which would have helped in covering costs associated with the ceremony. However, the Organising Committee opted not to accept any offer of sponsorship with the aim of ensuring complete objectivity with the decisions of the panel of judges and avoiding any doubts on conflicting interests. Mohan Pandithage, who served the logistics and transport industry for five decades, was awarded the most prestigious CILT Sri Lanka Pinnacle Lifetime Award by the Prime Minister. Pandithage is the Chairman and Chief Executive of Hayleys Plc, a Sri Lankan multinational and diversified conglomerate. Hayleys accounts for 2.73% of Sri Lanka’s export income. Having joined the company in 1969 as a Management Trainee, Pandithage today provides oversight into 184 companies in the group. A past pupil of Ananda College, Colombo, Pandithage is a recipient of the ICS Award of Excellence for the Best Shipping Personality, awarded by the Institute of Chartered Shipbrokers, Sri Lanka and a lifetime achievement award at the Seatrade-Sri Lanka Ports, Trade and Logistics (SLPTL) Awards. In addition to serving as Honorary Consul of the United Mexican States (Mexico) to Sri Lanka, Pandithage also serves as Council Member for the Employers’ Federation of Ceylon and acts as a respected member of the Advisory Council of the Ceylon Association of Shipping Agents, serving to advance the progressive interests of the industry while steering the profession towards a new paradigm in shipping, transportation and logistics. Above all, his leadership has attracted thousands of young people in Sri Lanka and facilitated employment in the logistics and transport sector. The Platinum Award of Sri Lanka’s first ever National Excellence Awards was claimed by South Asia Gateway Terminals (SAGT), after a close fight with the Gold Award-winner Hayleys Advantis. The Silver Award was secured by Unilever Sri Lanka. Recognising the contribution made by government institutes, the Sri Lanka Transport Board won the Bronze Award. The three merit awards were given to CL Synergy, GAC Group and the Colombo International Nautical and Engineering College (CINEC Campus).